@Buena Vista | Get Your Grub On! Double crabs per flavour is only half the fun. My lovely friend from Vietnam was paying her old home a visit and craved for some good old Singaporean seafood. As the usual choices were getting boring some of our friends suggested to go to ‘Master Crab’ down Ghim Moh Road. I came here before and remembered there was something I didn’t like about this place but couldn’t make out what it was. We were quite a few people so we wanted to order four different crabs and we already had made our choice of flavours when the waitress reminded me what it was that I had forgotten, ‘Master Crab’ only allows you a minimum of two crabs per flavour. So instead of the four flavours we ended up with only two – ‘Black Pepper‘ and ‘Vermicelli Crab‘ – Boo! Besides that one pretty annoying detail there was not much bad to say about the food. The ‘Vermicelli Crab‘ maybe was neither too special nor very strong in it’s flavours but the ‘Pepper Crab‘ was simply outstanding. 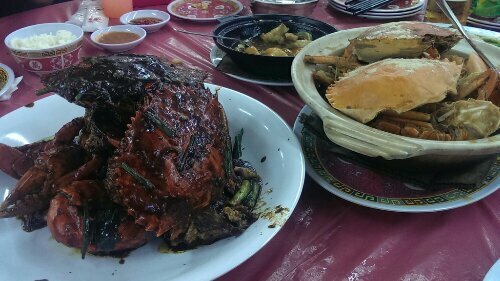 The gravy was extremely thick and stuck nicely to the crab which made it all pretty messy but finger licking good and the quality of the crabs was also top notch; packed with meat, fresh, sweet, amazing. They also know there veggies here as the ‘Sambal Kangkong‘ as well as the super long ‘Green Beans with Minced Pork‘ tasted great. ‘Master Crab’ sure is one of the good places for crab – well, at least for ‘Black Pepper‘ – but the impatient and mediocre service and especially the rule about the minimum crabs per flavour will probably make me opt for alternatives next time I want to go for crabs out of the usual. Lobster Rolls at Buena Vista! One of my work mates was desperately craving for a Boston Lobster Roll today so I researched a bit on the net and found this joint close to our work place – the ‘Boston Seafood Shack’ at the Star Vista mall at Buena Vista. After selflessly canceling all my gym plans we went together with another colleague to check it out after work. It is a place that reminded me of a mix of ‘Fish & Co.’ and ‘Long John Silver’, so generally where the younger crowd hangs out. Anyway we got us some ‘Snapple‘ from the fridge and ordered three of their ‘Boston Premium Lobstah Rolls‘ and waited for our buzzer to signal our grub to be ready. The rolls looked tasty and were well stacked with lobster meat. Unfortunately the taste didn’t really live up to it’s looks. The bun was brioche like sweet and too soft for me, a baguette instead would have fitted the dish better. The sauce was a bit blend and could’ve used some extra fresh herbs and salt. The lobster on the other side was fresh and juicy, cooked nicely and kept it’s natural sweetness. Overall it was not too bad but for just under 20$ for the roll next time I might look for other lobster vendors around the island.